It's a little after 2 a.m. in the back of an abandoned church uptown, and Arthur Brouthers is about to collide a pair of hummingbirds with a fistful of exploding stars. In just a while, a carefully mapped-out combination of chemicals and colors will combine in a process, perfected after years of trial and error, that will reveal a depth of life that extends well beyond the photographic eye. At work in this 19th-century building for almost a year, surrounded by every modern institution of modern American life in Charlotte, from government to banking, Brouthers has been quietly creating a body of work that Charlotteans are slowly coming around to. 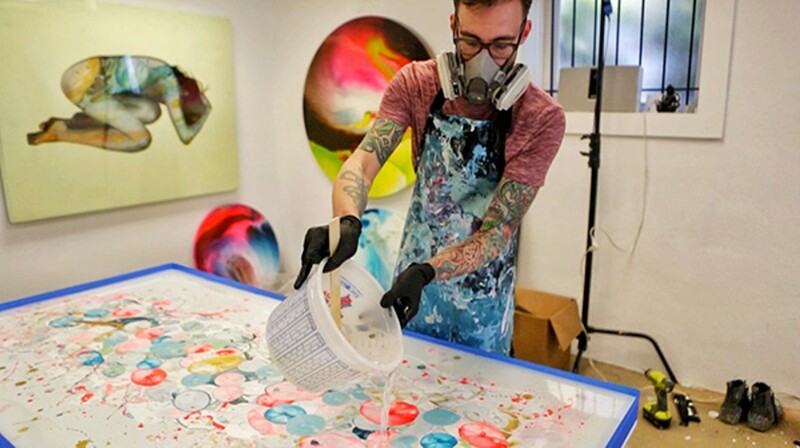 The passion surrounding his work by the small but growing group of locals who know about it is mirrored in Brouthers' approach to his process: quiet, but steady, and with an intense eye for an infinity of color and form. In the modern art world, the mega-city ports have always reigned as tastemakers for the country and world. San Francisco, Los Angeles, Miami and New York long ago were informally declared the go-to spots for any aspiring artists — visual, literary or otherwise — for testing their worth among the best. When painter Mark Kostabi laid out his four points for every artist to be a success, his first was: "Live in New York City." An arrogant statement if it wasn't apparently true — until recent times. The digital age has allowed artists to move in and out of these cities for the connections, while planting roots elsewhere. "The biggest challenge is making those connections and maintaining a network," Brouthers says. Sitting with the artist in his studio, you can't help but notice his sneakers: permanently stained with the most amazing juxtapositions of colors, much like his work. Red fights with blue amid white and gold specks as he taps his toes while making his point. "It's all about managing your time," he continues, "and if you try to simply broaden your local network, well then you'll be doing that forever. So go out and explore, see what's out there in the rest of the art world." Brouthers is no stranger to the larger art markets, but he chooses to remain in Charlotte because he loves the city and because it's close to his family. Born and raised in Charleston, S.C., he came here to work, and he passionately supports Charlotte's arts community, its institutions such as the McColl Center and its developing scenes in new spots like Camp North End and C3 Labs. In early May, Brouthers' work got an excellent reception as part of the Context New York show at Pier 94, and the artist is planning another group showing of his work at his own studio in Charlotte in September, before returning to New York City later that same month. In a recent spotlight of Brouthers, the contemporary art publication Hi-Fructose Magazine described his work as producing "wild textures that mimic celestial bodies and microscopic processes. 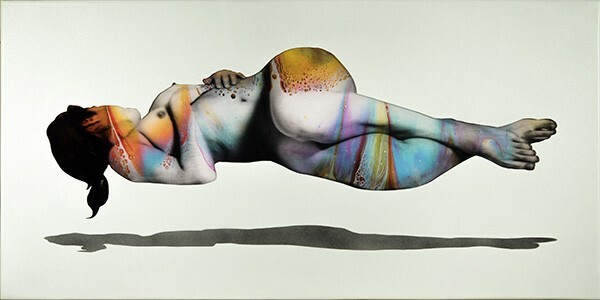 In the artist's figurative work, the human body takes on otherworldly form." Brouthers showed an inclination for art at an early age. By middle school, he was sketching with promise, but like many young people in the '90s he felt the pull of music. The budding pre-9/11 rave scene that captured so many Gen Xers across the world took Brouthers' imagination as well. "It was about being a part of something that was different, something that my parents didn't get me into," Brouthers remembers of his rave experiences. "And everything was OK at these parties; everything was accepted. People were expanding their minds, experiencing these vibrations and the music." Passion for music led Brouthers to carve out a successful career as a DJ, with high-powered sponsors like Red Bull taking him around the world between 2001 and 2005. "I had started producing and DJing when I was 18 as a hobby," he says. But he considered that simply getting paid to have a blast. "I got accepted to a few art colleges but my parents didn't see art as a lucrative career," he says. "So I went to school for graphic design and took what art classes I could to go along with the degree." Through it all, Brouthers painted and sketched on his own time, and eventually began to seriously map out a plan for making a living at it. "I painted on my days off from gigs and eventually started doing commissions for some Red Bull accounts, and did live painting at events through the company," he says. An early push from some interior designers working with Airbnb got Brouthers' work into some high-traffic lodging, which exposed his vision to a whole new group of people. Longtime supporter Heather Nikoncyk says, "I have always felt his art could resonate with any type of person, or add life to any living space." Brouthers' figurative works gave way to a more experimental approach in 2005, when a happy accident with paints unlocked possibilities for more abstract and non-linear approaches to color. Soon, he found himself on a path that provided a gestalt for all his passions: the non-verbal language of music, the spirituality of mediation, and the infinite possibilities of color and form. People around the artist began to notice as well. Brouthers' work was picked by the Sozo Gallery in Charlotte, and art patrons across town began to ask for more samples. "Men and women are equally drawn to his work. It pulls you in from afar, as well up close," Sozo Gallery owner Hannah Blanton observes. Jill Livick is a music educator with Charlotte's successful School of Rock program. She stumbled across Brouthers' work and was immediately taken by it. "I found it online and went to his art opening," Livick remembers. "I was awestruck with its vibrancy and femininity." "Hidden Ubiquity" by Arthur Brouthers. For such otherworldy results, Brouthers' process is quite workman-like approach. "Basically, I start out by taking a couple days to mix my colors, get the chemical ratios right; some colors get water some get certain types of oils, and I'll spend a day or two mixing those up depending on the effects I want to get. The paint I mix on the same day will have more bubbles. "So it really boils down to the effect I want," Brouthers continues. "I've got it down to a science that I started about 10 years ago. It all started with an accident, the way the paints fell and blended together." Accidents are key in Brouthers' work, but so is experimentation. "Sometimes I'll start the paint in the bucket," he says, pointing to four large two-gallon buckets around his table. "I'll separate the colors, and I'll sort of throw them down, then maneuver the canvas around to try to get different effects without it looking muddy." He shrugs. "I try to get it to where the composition is somewhat pleasing to the eye," he says. "So it's really all about the planning, and then getting everything prepared." Straightforward as his process sounds, the fruits of Brouthers' planning and preparation are startling. It's not hard to understand what Jill Livick and Hannah Blanton see in Brothers' pieces. One of his more recent works, Hidden Ubiquity (2017), is a hypnotic profile that arrests the eye with the gaze of its female subject, while pulling the viewer closer in with a subtle but masterful sense of shade and color, pulsing with its visual frequency. "I love how rich the color is in every piece; how the more you look at each piece the more you see," Nikoncyk observes. Like the name suggests, Hidden Ubiquity offers a look behind the curtain of the physical world, into the energy and flow just under the surface of the subject. A glimpse into the infinity that's in everything we see. Another piece, An Aerial View of Impermanence (2016), is a bird's-eye study of an ever-shifting landscape, or a crashing wave, frozen in time by the artist's eye, and a controlled collision of color and chemistry. A more recent piece, Still Visitation (2017), explores Brouthers' current fascination with hummingbirds. "Their symbolism, particularly with ancient people and Indian tribes, as spiritual helpers has been an inspiration," the artist says. "I'm definitely inspired by spirituality and psychedelic things. The shamans who consulted tea leaves and stones." Still Visitation depicts a moment of quiet communication between a hummingbird in flight and a girl, whose hand is outstretched. Is it an offer or an inquiry? That's up to the viewer. Brouthers takes into account the inclinations of his viewers. "Other people might be like, 'Hey, I really like this piece because hummingbirds remind me of my grandmother, or when I was kid," he says. Brouthers says Charlotte will always be his home base as an artist. The advances in the city over the last decade, he says, allow artists to remain in close contact with the high-energy markets of New York and the West Coast, while remaining safe from skyrocketing rents and other hazards of fast city living. And it is in Charlotte's best interest to keep and nurture its artists; to foster them and present new Southern painters and multimedia artists who challenge stereotypes about the kinds of creative people coming out of the South. "We're on a pretty good path right now as far as murals and other public art projects," he reflects. "Charlotte is on the right path because, five years ago, I would have said more public art was needed. Now I feel like it's happening." 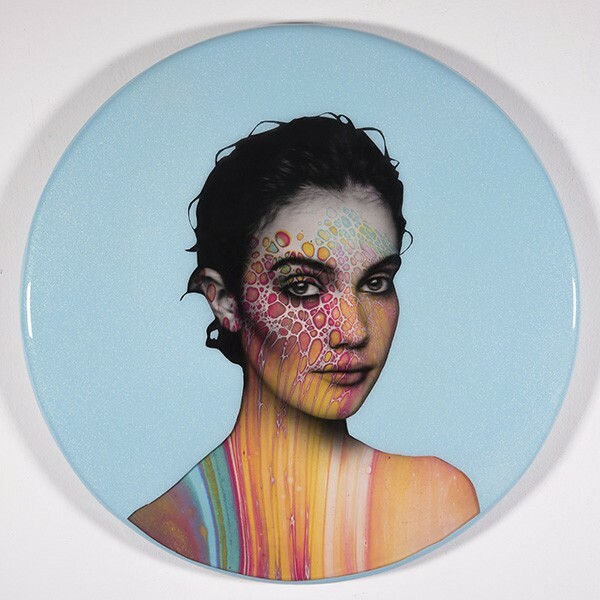 As the South and the country as a whole seems to be moving ever farther into a morass of discord and conflict, egged on by extremists, religious, political and otherwise, it's the artists who remind us that we are all ultimately more than just similar in our make-up. As Brouthers' work seems to suggest, we're all part of the same stuff. We're all held together by the same frequency. It's getting close to 4 a.m., and Brouthers is finally closing up shop as the city begins to shift into another day. All around him, his work, in varying degrees of completion, testify to his passion for color, for unity, for form and freedom. The hummingbirds gaze back, now shimmering with a life previously unseen but evident in their movement and their inherent perfection, brought out by the eye of an artist who has discovered, like others before, that art is the ultimate product of the sciences, marrying the creative with the formulaic. Brouthers pauses for a moment to reflect on his journey to now, and the disparate pieces that fell together to form the symphonic controlled chaos of his colorscapes. I ask what may seem to be a loaded, complicated question: What, at the end of the day, informs him? He answers without the hint of a pause. "Music," Brouthers says. "The old club scene in all its colors. And the tools I've gained through studying and meditating." He thinks for a second, nods to himself, then continues. "We don't have much time on this Earth," the artist says. "We need to maximize what we're capable of doing, without going off our path too much."